Tuesday I made a blouse. turns out the changes I made to the pattern were wrong, and the bust dart was wrong again. The sleeves looked a tiny bit tight. Weds I made a blouse - slightly stretchy seersucker plaid. The dart was good, length was good, fit was good - the sleeves were too gathered. I emailed Glenda and she replied within hours. She said my sleeve top was too wide, not too tall. I had Home Ec in 9th grade. I remember one of the first things we did was learn to make a white sauce for vegetables. I really wondered why glom up perfectly good vegetables. I used to make my own yogurt 4 quarts at a time. Also loved to make bread, though. I used to make my own Bisquick - it was called "Missouri Mix" from a University extension pamphlet. Do they still have those, I wonder? Also, while my husband and I were still in college, we had a large group of non-American student friends - from India, South, and Central America, and decided to make a huge Thanksgiving party for everyone. The tradition of a big Thanksgiving has continued with all my husband's family getting together (His sister had 9 kids.) (My family is farther away, but would be welcome also.) I am famous for the dressing, giblet gravy, and for a cranberry relish my grandma used to make. I began the quilting on my grandson's quilt. I have put it off for ages, because I couldn't decide what type of quilting I wanted to do. 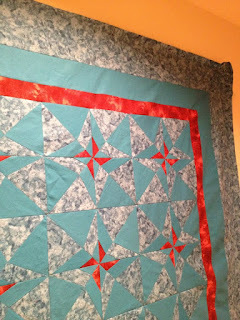 I had thought I would do straight-line quilting a quarter inch from each star shape, and in the solid triangles. But all that stitching would show, so needed to be quite good. Finally today, I just set up the machine and started meandering in the mottled areas. It looks pretty good, is going fairly fast, and doesn't have to be perfect. It is, after all, a quilt I expect to be used, hard. -- pictures when it is done! If you have never heard of Sure-fit Designs, they are a sewing pattern company that teaches you to make your own patterns from your own measurements. You never have to figure out adjustments to commercial patterns again. But if you want to use a pattern, you can overlay your sure-fit blueprint on the pattern, and get quality results very quickly. But I am alternately eager to make it work, and paralyzed by the enormity of the thing. I WILL make this work, then add the sleeves and skirt - and have a shirtwaist pattern ready to go. Then I will master the pants for my new body shape. Then hopefully, in about another 6 months, I will have lost another 30 pounds, and have to do it all over again! !